You know you’ve come across a good book when it stays with you after you’ve finished it. Whether that’s in the way you look at things with a new understanding or whether you find yourself speculating beyond the last page you know that for a time it will be there. Rarely have I come across a book that haunted me like The Ship. Long past that normal period of recalling and reflecting I found it drifting into my consciousness. I read it to Mrs Van and it was the same with her. Months after finishing, we were watching the news one night and a particular bulletin resulted in us turning to each other, eyebrows raised, saying, ‘The Ship!’ It’s no surprise that this book was among my top 5 of 2015, and I don’t need to tell you what an endorsement it is that it was in Mrs Van’s top 3, so I am delighted to be involved in the blog tour for the paperback launch of Antonia Honeywell’s The Ship. Antonia kindly agreed to answer just a handful of the many questions this book gave rise to. I hope you enjoy her responses. What sparked this story in your imagination? How did it become a story you wanted to tell? Do you read Dorothy L. Sayers at all? She is one of my go-to favourites for a good story well told, and her heroine, Harriet Vane, is a poor but fiercely independent woman who writes popular detective fiction. When she marries the wealthy Lord Peter Wimsey, she finds that her unwonted happiness and security sends her writing into darker places. That was my experience too. In my early thirties, for the first time in my life, I was able to look at someone I loved and think, ‘You love me,’ with confidence. (Politically we’re poles apart, but at least mealtimes are never boring.) It set me thinking about the terrifying prospects the human race is facing, and the responses of those with the power to effect change. The sense of claustrophobia on board the ship is heightened by what’s either withheld from or simply not acknowledged by Lalla. Of the people that interact with her and shape her journey who was the most difficult to get right? One of the themes running through the Ship is the misuse of our planet’s resources. Did you undertake a lot of research around the science involved in the world you portray? What surprised you the most in what you discovered? I did indeed. I’ve got files full of the stuff. Not just the misuse of the planets’ resources, but the amount of tinned tuna it would take to feed 500 people for 20 years and the biggest bags of rice you can buy and how long cooking oil keeps for and whether you can power a freezer from a solar panel. What surprised me most about the resources question is just how much we know about the damage we’re doing to the planet. It’s no mystery; the information’s all there, researched and proven. We know we are sitting on finite resources, and yet we buy strawberries in December and fly our green beans in from Kenya. We know the cost of cheap clothes, both for the environment and for those who are paid slave wages for making them, and yet Oxford Street is packed every Saturday. And I’m as bad. I have my car and my gas central heating, and although I don’t buy many clothes that’s only because I hate shopping. On the other hand, I don’t fly to Antarctica to personally inspect the impact of global aviation on the environment either. At what point do we stop and tell ourselves that what we’re doing is wrong? Of those resources it’s arguably food that plays the most important part. Was it always your intention to have this focus or was there a process that led to its prominence in the story? I think food is where it’s at, ultimately. We have to eat. The way we organise housing and education, the role of technology in our lives, how we travel will change, but if we don’t eat we’ll die. And in the western world at least, food has become increasingly separated from its source. Industrial farming is a long, long way from the pretty pictures on the sanitised packages in which we buy our meat. Food storage is an advanced science; it’s completely possible to eat a full diet using stored food. Tinned vegetables and fruit often contain more nutrients than the fresh ones we buy in the supermarket. By living in such isolation from our food sources, we’re depriving ourselves of the chance to understand them. I feel that we’re understanding less and less about more and more of the things we rely on for survival. I understand your short story, The Time Being is included in the paperback. Which came first, the novel or the short? Have you thought about writing beyond the last page and doing a sequel? The novel came before the short story. The publication process for The Ship was already underway when W.F. Howes, who did the audiobook, requested the story. At first I was rather nervous, but the chance to explore Lalla’s pre-ship life was irresistible and in the end I loved writing it. 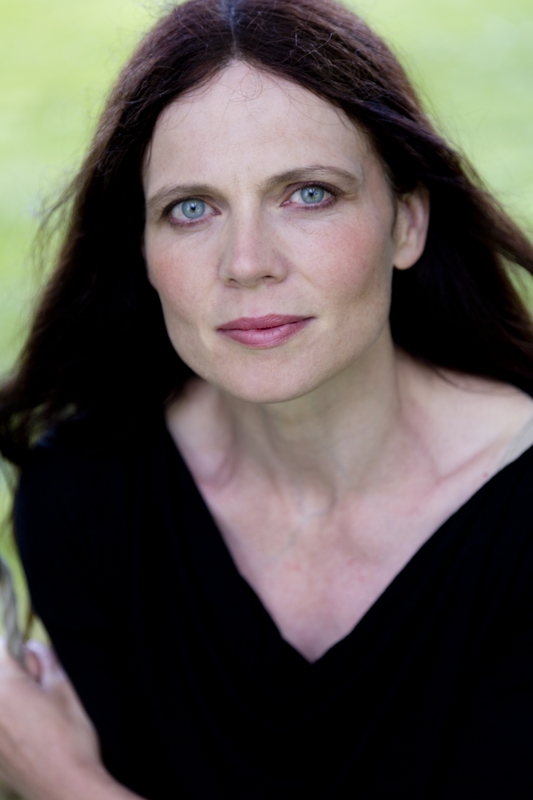 As for writing beyond the last page – well, twelve years ago I was never going to marry or have children and here I am with a husband and four incubii. Having said that, The Ship was written as a complete story. 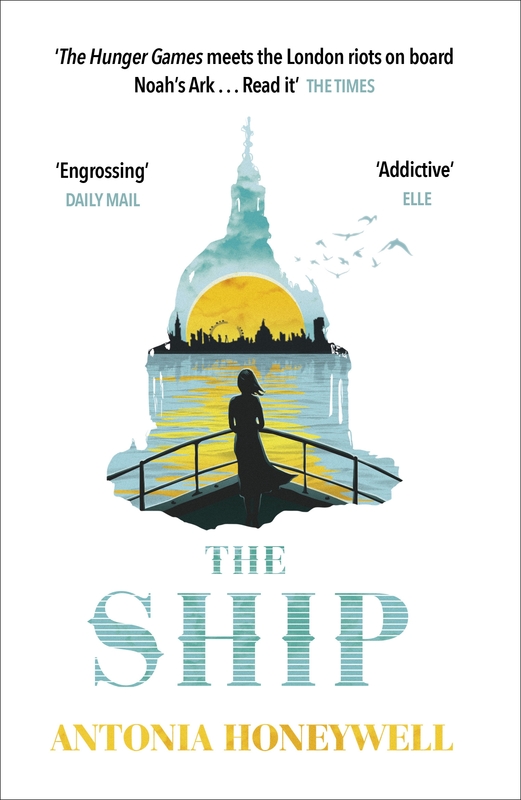 You are a year on from the initial publication of The Ship – your debut novel. What’s changed since then in your writing, your expectations and the expectations of others? The Ship was my first published novel, but it wasn’t the first novel I’d ever written. I served a long apprenticeship of failure, during which I learned that the only way to be a writer is to write. And write. And write. I always thought that publication would magically create writing time, so I strove for it, creating time where none existed. Then I got published, and whoever or whatever was going to give me all that time obviously didn’t get the memo. The children still need feeding, meals still need putting on the table, bills still have to be paid… So I’ve learned, really, that nothing changes. Except everything has. I’m still writing surrounded by chaos, making the most of the gaps, but now I’m writing this, for you, because my paperback’s coming out. And that brings a sense of deep contentment. There’s some really nice imagery in the book, and I particularly enjoyed the subtlety of the inverted Adam and Eve moment in the middle. Were you aware early in the process that you wanted the religious parallels or is this something that emerged during the writing? I wanted them but wasn’t sure how to get them in. But as I wrote and redrafted, I realised that they were there naturally. I just had to give them a bit of space. There seems to be a wealth of young adult protagonists in literature at the moment and dystopias of many flavours abound. The future vision of the Ship is particularly stark, though scarily, not that far-fetched. Do you think literature (and by association, writers) has a valid role in waving a warning flag to the younger generations? Yes. Yes, I do. I remember reading Robert Swindells’ Brother in the Land when I was twelve or thirteen and having my world turned upside down by it. After all, it’s the younger generations who have to live with what we leave behind, just as we had to live with the world our parents and grandparents created. It’s a formative life stage – are you going to continue down the same route as your parents, or challenge it? Literature speculates to entertain, but it also speculates to explore. What’s the best editorial advice you had for the Ship? The absolute best? It was terrifying. Brace yourself – my editor told me to change the ending. I was horrified – the ending was the one fixed point, the thing I’d been sure of throughout the writing process. That advice taught me two things – firstly, that nothing you’ve written is sacred. Nothing. Secondly, that the problem doesn’t necessarily lie in the part that’s been identified as the problem. I didn’t change the ending, but I did change almost everything else. It was the right ending, but I’d been so sure of it myself that I hadn’t written up to it effectively. I’m grateful for everything my editor did, but that stands out for me. With a growing sense of disconnection, Lalla makes her own little Museum to keep important things in. What would you put in your museum? The value of Lalla’s museum is that the things in it are only valuable insofar as they relate to her story. No gold, no diamonds, no artefacts of exquisite workmanship. What would be in mine? The poem James wrote when he proposed. The cork from the champagne we drank when our first child was born. A paper of seeds from the guerrilla sunflowers the children and I planted all over the garden a couple of years ago. Or this – last week, I took my father to the theatre. The last time we went out together was when he took me to see The Empire Strikes Back when I was nine. I don’t know how you put that in a glass case. Maybe that’s why I write. 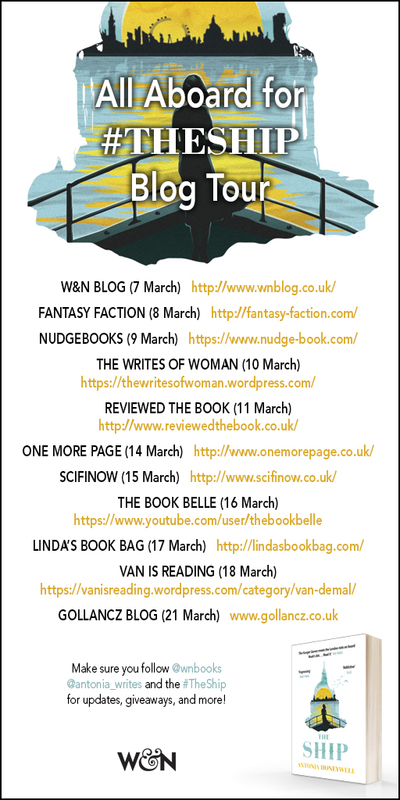 Thank you so much for your support for The Ship, and for having me on your blog, Van. It’s been a real pleasure. If you haven’t yet read The Ship (why ever not?) you can find it at your local (Independent or otherwise) book shop. If you have read it, find a friend who hasn’t! Tags: "Antonia Honeywell", "blog tour", "Q & A", "Q and A", "The Ship", "Van Demal", "vanisreading"
I don’t recall how it came about – some happy conjunction of two of my favourite things, music and books – but whatever prompted it occurred as I was welcomed into the fold of the Curtis Brown Book Group, the result being tweets attributing theme songs to characters in Antonia Honeywell’s The Ship (our first read for the Book Group). It was fun trying to pin down a song that captured a particular character’s demeanour or struggle so when the next book came around I found I was already thinking about the soundtrack that would accompany the story. And so the #CBBookGroupie playlist was born. Some choices were obvious and instant, others took a little pondering. I think those characters with whom I engaged more readily proved not necessarily the easiest to find a theme for but certainly the most enjoyable. Indeed, where I felt the layers of a particular person it often proved more challenging to find the right tune. And then of course there are as many good songs as there are good stories. I’m convinced there are more pertinent choices out there, if only I had the time to track them down. What did prove really interesting was the response from the authors when I tweeted the choices (I think only one response amounted to ‘meh!’ but that was for just one track and I suspect more about the song than anything else). It seems some writers compile playlists to assist in the writing of their books – certainly an interesting element of research for more recently historical fiction! Having attributed the songs, the next step is to apply some listenable order. If you’ve read high Fidelity, or made your own compilations you’ll know that there are rules to doing it properly. So here it is, in full: The #CBBookGroupie playlist. I don’t confess to have mastered the art of compiling but I do think I’ve managed something listenable. I’ve not included links to all the songs as it would prove a bit link-heavy (and one or two you might not find on t’internet!) but there are links to my reviews of the books. **Sophie’s not in the Weightless World but was a member of the Book Group. To quote, ‘Nick knows.’ And any reason to get some Nick Drake in is a good reason! *I originally had Nina Simone’s Sinnerman in the mix for Grandad from the Girl in The Red Coat, too, but the ten-minute version unbalanced the flow. Whilst I’m not likely to pick songs I don’t like, and even though I say it myself, they’re not bad playlists if you’re after a couple of hours of uninterrupted listening. I’m always on the lookout for another great book to read, or another great song to listen to, so if you’ve got a killer theme for a cracking character, or even a better choice for one of the above, why not leave a comment and share it with us all!